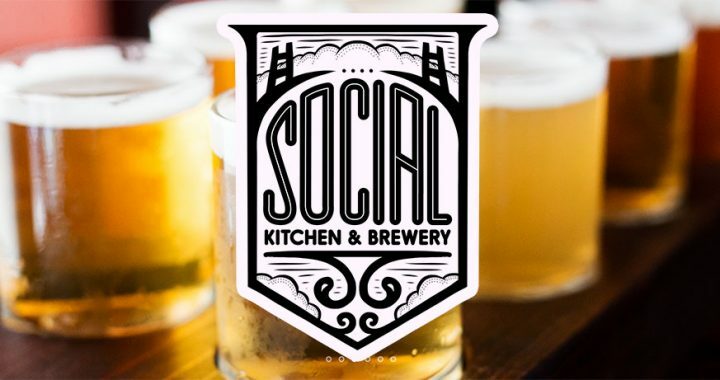 Kim Sturdevant from San Francisco’s Social Kitchen and Brewery is our guest on Brew Ha Ha with Steve Jaxon and Mark Carpenter. Herlinda Heras is traveling again this week and will call the studio from Poland in a few minutes. She is one of the judges in the Polish National Beer Competition in Poznan. She will also be co-hosting a big beer festival in China later this month. She will call in from Poland in a few minutes. 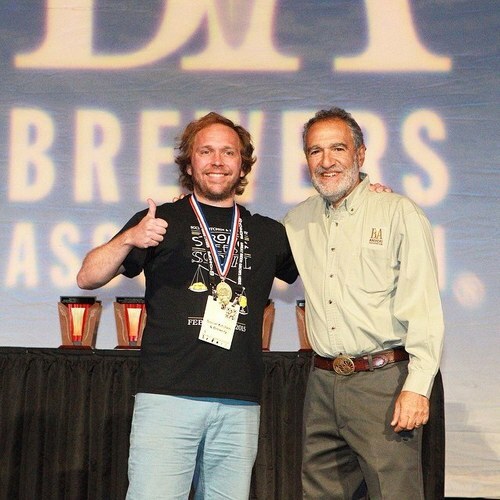 Kim Sturdevant won a Gold Medal at the 2015 Great American Beer Festival. Kim invented the Brut IPA and Black Lager. He’s the owner of Social Kitchen and Brewery in San Francisco.Kim Sturdevant has made a Black Lager beer, which they are tasting. Mark thinks it’s delicious. It’s not heavy at all, a very nice light beer. Mark says he’s innovative and is doing a lot of cool stuff. Kim started brewing at Marin Brewing Company in October 2006. He got a brewing job and rose through some promotions for five and a half years. Then he became brewmaster at Social Kitchen and Brewery. He has free reign over beer operations and his innovative beers are the result of this freedom to experiment. The black lager is based on a traditional German Swartz beer (swartz means black). It’s also brewed with Spelt malt, which is called Dinkel in German, so its name is Dinkelswartz, which is fun to say. The spelt malt lends a nutty flavor. Spelt (also called farro) is an ancient type of wheat. This is 5.6% alcohol. Mark says it’s clean and nice and crisp, a great beer. Next they taste the Brut IPA. Mark thinks this will become a popular style, it’s the first new style in many years. When he started making IPAs it was hard to keep them clear. Now hazy beers are popular. But the Brut IPA is clever and creative. It uses enzymes that were only used in light beer and Mark is impressed by its creative style. This is 7.2% alcohol but doesn’t taste strong. Mark says it has more aroma and less bitterness. At this moment Herlinda Heras calls in from Poland, via Skype (with excellent sound quality!) where it is late at night. She is there to be a judge in the Polish National Beer Competition. There are judges from all over the world. She is one of the only Americans. She judged some “West Coast IPAs” which is what they call our American style beer. She can’t say it was great, as much as she loves them. So they asked her to bring some West Coast IPAs to them next year. They have a climate that is normally too cold to grow hops. She comes back Saturday, then on Sunday she leaves for Shanghai to co-host the China Craft Brewers Association Awards. After the break, they talk about the Brut IPA. Mark thinks a lot of this beer and is honored to hear the story. Kim tells how it all started when a friend brewer tipped him to using enzymes to break down complex sugars and starches. The enzymes in barley malt turn the starches into sugars, which are smaller carbon chains that the yeast can consume. There are enzymes that keep doing that and convert all the starches to sugars especially glucose, which is fully fermentable. He was using it in his triple IPA as a way to make it less sweet. He thought, what if I applied this to a standard strength IPA, so the hops could shine through. Dry and hoppy but balanced. He wanted to make it champagne-like, pale and spritzy and refreshing. Mark says it’s really different and that it will become popular. Kim describes the process in detail. The name Brut came from a friend who tasted it who also likes champagne and she suggested the idea. He made the first one about a year ago. There is also a handful of places in San Francisco making Brut IPAs. Mark says Drakes and Henhouse are both doing it. Kim started a batch of Brut IPA at Henhouse a few days ago. This one will be more carbonated and the batch will go into cans. Mark says these inventions often get lost. For example, nobody knows who was the first to make Steam beer. But this is well-documented, that Kim Sturdevant has created Brut IPA. Social Kitchen and Brewery opened in 2010 and he joined them in 2012. It’s in the Inner Sunset district of San Francisco, two blocks south of Golden Gate Park. Steve mentions this article in the SF Gate about Brut IPA. Next week, Kim Sturdevant goes to Argentina to meet brewers there.